A Nashville school trains people to get behind the wheel and shuttle rock entertainers to their next gig. Michael Brame's wife calls him "the most undependable husband in the world." He'll agree to a day of errands, then his phone will ring. Two hours later he's at the airport, off to fill in as a "relief driver" for Salt-N-Pepa or Tim McGraw's crew. A former mobile DJ, Brame (who is known as Michael B) graduated as part of last year's inaugural class at Nashville's Celebrity Bus Drivers Academy, launching him on a second career driving tour buses for the rich and famous. Students who successfully complete the program at this one-of-a-kind school get assistance nabbing temporary assignments. 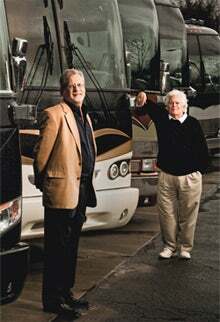 Veteran tour driver Chip Huffman, one of the academy's founders, started the school in 2009 with partner Tandy Rice. In the old days, Huffman says, a band member would just pack up his fiddle after a gig and get behind the wheel. But in 1995, the U.S. Department of Transportation required entertainers to hire professionally trained drivers and limited the amount of time drivers can spend behind the wheel. Huffman and Rice gassed up their plan to fill what they knew would be a growing need for qualified drivers. "The driver selection pool is getting smaller and smaller all the time," Huffman says. "One of my goals was to train drivers to do things the right way." Academy students are vetted before admission based on driving records and their ability to deal with celebrity personalities; they also submit to criminal background and credit checks. Most learn about the school by word-of-mouth, but the program also advertises in truck stop magazines. Huffman weeds out prospects who seem to just want to hang with the stars. Students are trained on more than just getting from point A to point B. Huffman uses his own experiences to prepare students for everything from cleaning the bus bathroom when a band member has had a few too many to alphabetizing the soda in the cooler on the bus (per the request of one country star) to setting up the on-board Wi-Fi and keeping the bus in good repair. To avoid fines, musicians must give their drivers eight hours off after they drive for 10. If they're headed from Detroit to Atlanta overnight, that means a relief driver must be ready to take over, either by sleeping in a bus bunk or flying in to meet the bus en route. The academy trains a maximum of 20 students per session, twice a year. Sessions are timed so that graduates can hit the road as bands' touring seasons heat up in the summer and at Christmas. Huffman doesn't want to increase enrollment yet. Too many students, he says, would flood the market and undermine the job placement offerings. "There are approximately 1,000 entertainment coaches in the country," he says. "We do not want to saturate the market." Courses are taught at a Music City facility owned by Prevost, a tour bus manufacturer that provides the space free of charge in exchange for being the academy's sole corporate sponsor. In addition to Huffman and Rice, faculty members include Prevost technicians as well as tour managers and other industry pros, all of whom teach in a panel discussion format. Sessions are jammed into less than a week so that students (who pay $1,000 each, plus the cost of getting to Nashville and their hotel bills) can get back to work as soon as possible. Huffman makes it clear to students that their new work life won't be glamorous. While there might be some jamming on the bus (think the "Tiny Dancer" scene in the movie Almost Famous), more often the band sleeps as the bus rolls on. And forget about seeing the gigs. "The last thing the band wants to do is look over and see their driver standing by the stage," Huffman says. "They want to know that their driver is back at the [hotel] room getting a good day's sleep."